The game "Fatal Frame II," part of a franchise of games on various platforms, which began with the 2001 release of "Project Zero" on the Playstation 2. The game was designed by Keisuki Kikuchi, was developed by and is published by Tecmo. Kikuchi was the design lead for the first three games, and is the co-lead for the fourth, a title created for the Nintendo Wii. The game has become a staple in academic videogame criticism. 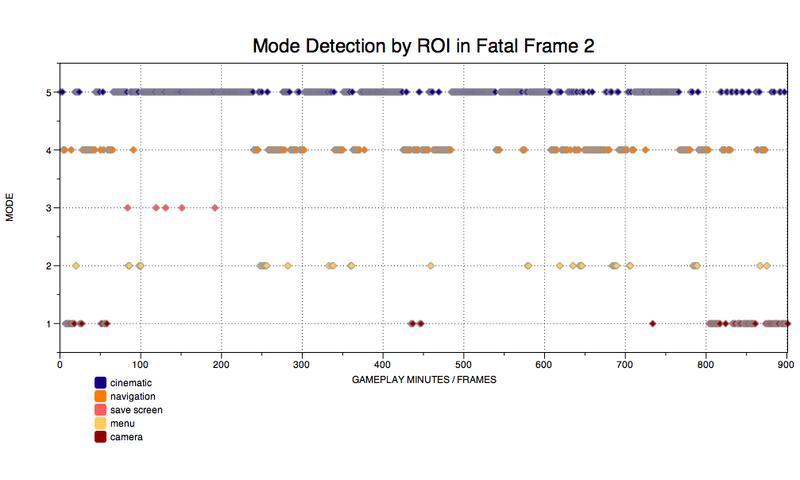 This project included the application of cultural analytic techniques to identify the transitions in modes of gameplay, in order to characterize the mechanics for generating suspense and uncanny aesthetic experience in a videogame. In this game, the camera obscura, a camera with the ability to see supernatural entities, replaces traditional weapons found in most other games, and is at the center of the most important player activity: the simultaneous documentation and exorcism of spirits. What importance in this case means is not simply a function of time, but rather is the activity of peak excitation, that in which the player is in greatest peril of failure, the activity which makes the most demands on the immediate attention of the player throughout the course of the game. This action is distinguished from the practice of navigating the space of the game in a trade-off that is made between freedom of motion and freedom of view: when the player is in a navigational mode, the camera is completely controlled by the CPU; when the player is in camera obscura mode, the player has full freedom of rotation for a 360º view, but is unable to move. Additionally, certain elements appear in the visual field whenever the camera detects a supernatural entity. To place the experience in context, we identify the different modes of the game, the regimes of signs and agency which are present at any moment. The first is the cutscene: a mode in which the player's interactive agency is removed and their attention is called to various narratological, aesthetic, or game-diegetic elements (e.g., clues for the solution of puzzles.) In many games, these are indicated by letterboxing and/or FMV. 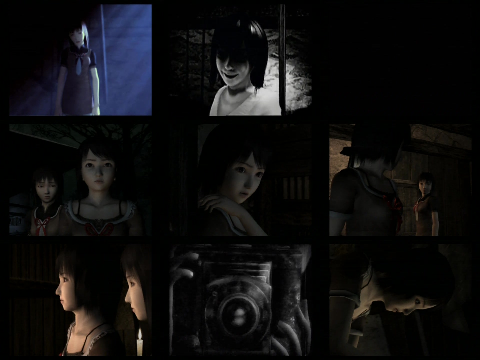 In Fatal Frame II, on the Playstation 2, there is no letterboxing; however, they can generally be recognized by the absence of other display elements. Another is the navigational mode, in which the player's interaction with the controller moves the avatar through the rendered three-dimensional space of the game; this mode constitutes the majority of most players' experience of the game. The depth and nature of player attention demanded in this mode can vary. It may not be far off to describe this mode as the canvas for the others; the default spatio-temporal posture in the Lost Village. 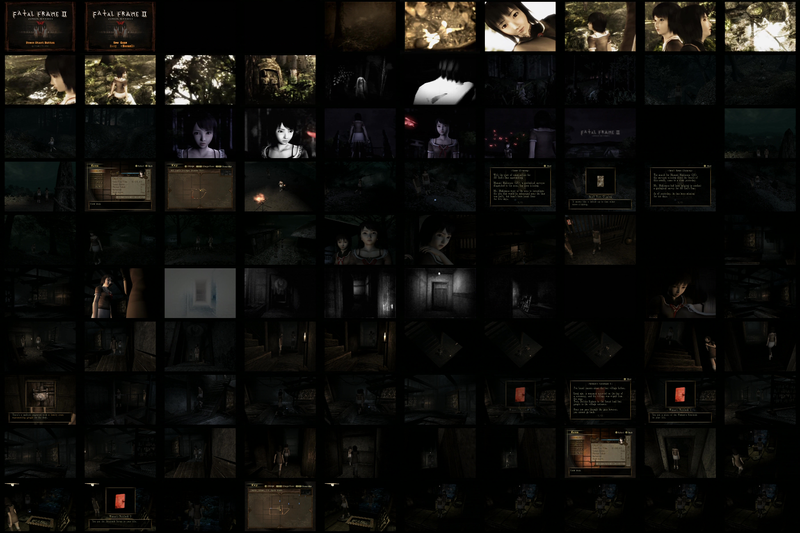 In Fatal Frame II, this is a timeless mode; one generally invites danger only if one moves. The camera itself is discovered in the 1st chapter of the game, in the 1st of a number of buildings which the player explores. Camera mode is accessed from navigational mode: the player presses the square button to shift between the two modes. Shifting into the camera mode arrests mobility. 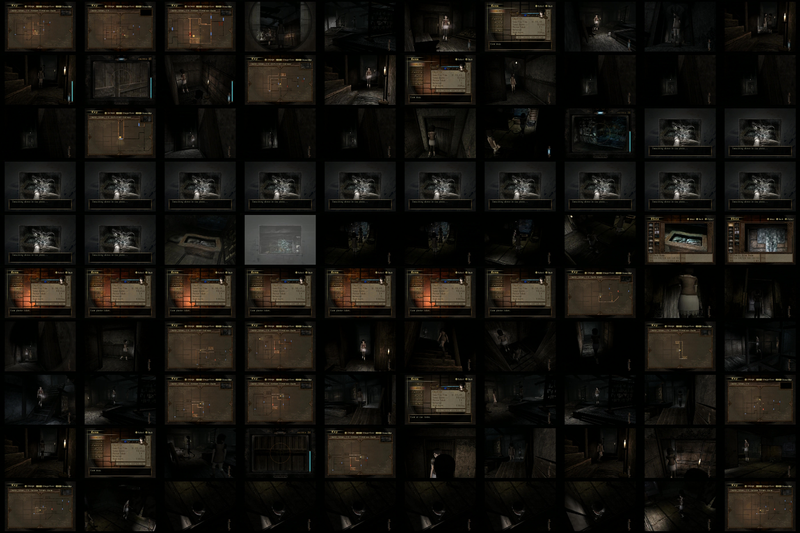 Other modes of player-game activity include inventory screens, camera-upgrade menus, photo-album modes, various diegetic inscriptive systems (discovered notebooks, discovered newspaper clippings, the spirit radio and the discovered ethnographic film footage.) There are interesting aesthetic and narrative effects created by these elements; however, my observation is less about the specifics of Fatal Frame II and more about the relationship between the overall experience of the game as a horror video game and the aesthetics of the uncanny and the eerie. For the sake of clarity, we have isolated two of these modes as significant: a generalized "menu mode" in which various auxiliary operations occur, and the save-screen, where a player saves or loads a game. This animation displays a sequence of mode transitions over several hours of play. The oscillations between narrational, cinematic and operational modes are a kind of "catch and release". 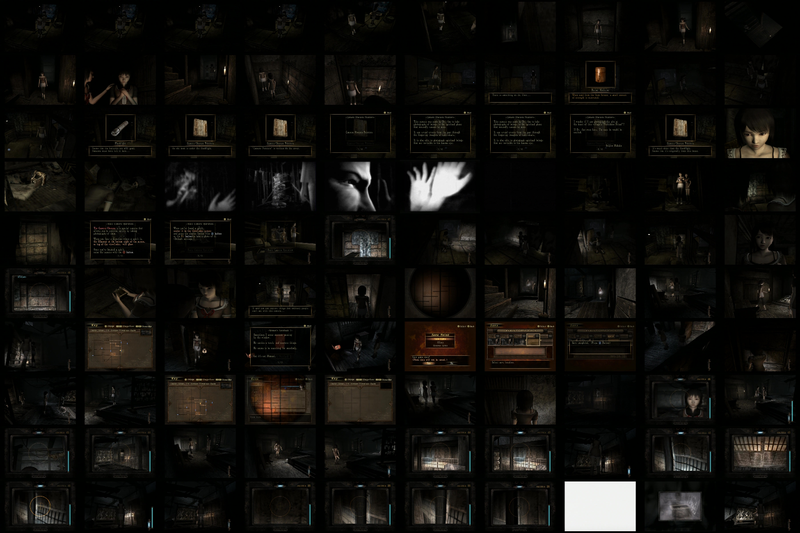 The cut scenes and cinematics, during which the player is not called upon to act, release the compression created when the signs of the uncanny accumulated during operations are instead relased into another kind of reading. This release is never complete: even as the player is transfixed by the phantasmic spectacle on the screen, the sequence may contain clues and indications which the player will need to progress through the game. Something that emerges from reviewing the transcripts of play sessions is the very episodic nature of play. Not only do players use save-points in the ways we might expect - to save progress to avoid having to repeat a passage, or in order to end a session - but menus are also called up to freeze play, as a pause mechanism. These patterns of saving and pausing are the player's way of managing the tempos of the game experience in the interstices between intense and semiotically dense sequences of play. The ambition of our game-analysis work at the Software Studies lab is the collect and process complete traversals of the game from multiple players. Getting the footage is a tractable problem; however, the image processing we are performing is computational demanding past a certain scale.